I was so pleased to come across your Acorn System One site; its good that someone has taken the trouble to log this little piece of history. It brought back some good memories for me. In 1979 I was training to be a mechanical engineer but I got interested in electronics and programming. Having got frustrated with the lack of access to the college mainframe I decided I needed my own ‘computer’. I dragged the girlfriend off to Birmingham in July 1979 and whilst she shopped I went to something called the Breadboard Exhibition and ordered a System One. I had no idea what it would do or what I wanted to do with it, but so what. Girlfriend was a bit bemused to say the least. The kit duly arrived and was up and running quickly. I spent many many hours learning and writing assembler programs. My real interest was in hooking it up to things like motors and sensors. I did a few projects with it. The first was a crude X–Y plotter made from Meccano, driven by those yellow Meccano motors with opto sensors and slotted discs for feedback. The most challenging was building a small robot arm (see picture below) that moved blocks onto a conveyor belt and stacked the blocks at the other end. This was built from September 1980 to May 1981, for a college project for the engineering course. Again, it was built out of Meccano and other modelling materials. For software I simply used a lined pad of paper – wrote the mnemonics out by hand in one column and then hand cranked the opcodes in another; no assemblers or anything – backward branches were always the worst to work out. The program was quite large as I remember and filled the System One memory all bar a few bytes. Thinking back now, that it worked at all was quite astonishing, but it did. The college must have been reasonably impressed as they bought the whole thing off me; I was moving up to the Atom by then. A number of System One owners joined the fledgling “6502 User Group” in August 1979. We shared experience and tips by post and the ‘Bits and Bytes’ newsletter. Through this I met another owner who lived close by. Frank was in his 70s and we would regularly meet up to discuss programs and hardware topics. He was a real whizz with the System One. In December 1979 we travelled together to the first 6502 User Group meeting and AGM in Luton; I remember the Acorn people being there and demoing some of their latest kit. Frank acquired a couple of ancient teletype terminals and I put together an interface circuit and driver program so that we could print out simple binary listings of programs. It was quite amusing watching this mechanical monster rattling away printing out lists of characters. I moved on the Atom. I drove down to Cambridge and picked the kit up direct from Acorn’s office. The Atom still lives on in a box in the attic along with the System One notes; so glad I didn’t throw them away. Occasionally I fire the Atom up to show my own lads what ‘real’ computers used to be like. 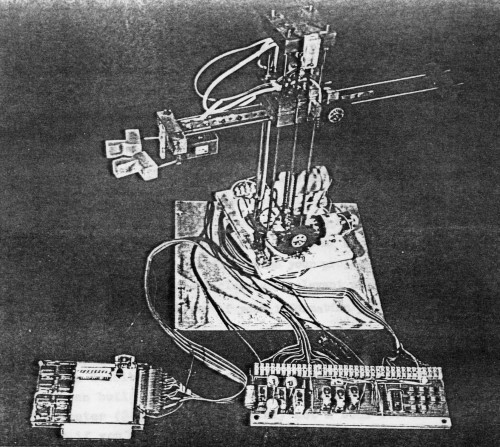 A photocopy of a picture of the robot built by Michael Bardill. Photographs and HTML text © Mike Cowlishaw 2001, 2002, except where obviously others' words.